Are you an enthusiast photographer? If YES, then the platform is yours! The Climate Tracker Photo Contest 2019 is open for entries. Are you passionate about photography and climate change? Show what you got. In 2017 and 2018 alone, populations around the world were exposed to heatwaves (in Japan and the United Kingdom, for example), severe flooding (in China, France and India), wildfires (in Greece, Sweden and the USA) and tropical storms (in Japan, the Philippines and the USA). Climate change impacts health both directly and indirectly. Some of the health impacts associated with the climate crisis include respiratory diseases, vector-borne diseases, heat strokes, mental illness and others, as mentioned in the latest report on Health & Climate Change launched by the World Health Organization during COP24. This year, in partnership with the World Health Organization, Climate Tracker is launching an exciting photography competition to highlight the impacts of climate change on human health. 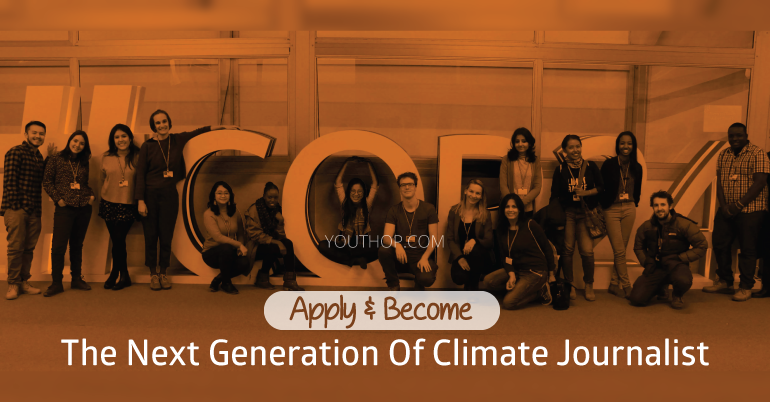 Since 2015 Climate Tracker has delivered cutting edge training, innovative media campaigns, and brought incredibly talented teams of young reporters to the UN climate negotiations. They have delivered in-person training in more than 30 countries, hundreds of online webinars, and awarded travel scholarships to more than 350 young journalists. They have run participatory media research in over 20 different countries, and are developing a unique data-analytics tool to give journalists the best possible chance to “cut through” national debates. These young journalists have published more than 6000 articles in their national media, covering more than 114 countries and 24 languages. They have supported young journalists from Afghanistan to Zimbabwe, Costa Rica to Fiji. More than 90% of the opportunities have gone to young people from developing countries who can make big impacts in their national media. If you are a first time writer or a seasoned journalist, this is your chance to win a career-changing opportunity. More than 60% of their awarded trackers have been women. The global team is over 75% of women. Everybody is welcome to participate. They are looking for 8 winners from around the world who can show issues related to health, climate and development through their photographs. They accept applicants between 18 and 30 years old. However, you are encouraged to apply anyway if you are above the age limit. 8 winners will be selected to produce a photo story (30 – 35 photographs) about the impacts of climate change on health. After completing the photoshoots, the 8 winners will receive a 200 USD cash prize. These photostories will be featured in an eBook that highlights the work of the photographers. Following the 8 photostories, 1 winner will be awarded a fully-funded fellowship to attend the COP25 in Chile on December 2018 with the with Climate Tracker team! Everybody is welcome to participate. They are looking for 8 winners from around the world who can show issues related to health, climate and development through their photographs. They accept applicants between 18 and 30 years old. However, you are encouraged to apply anyway if you are above the age limit. A photograph or a photostory (up to 10 photos) that shows the challenges and/or the solution to issues related to health and climate change. By completing your submission, you agree that Climate Tracker and WHO is allowed to use your photographs on their social media platforms for non-commercial purposes. Air Pollution: you could show the pollution from public transportation in a city, for example. Vector-borne diseases: diseases such as malaria, dengue, etc., which affect populations around the world. Climate change-induced disasters: how are the communities being affected by these climate-induced disasters? What type of adaptation measures have they started? Food security: you could take a look at issues related to malnutrition, agricultural practices, and others. Migration: you can show how movements of populations due to environmental issues are also exposed to diseases.